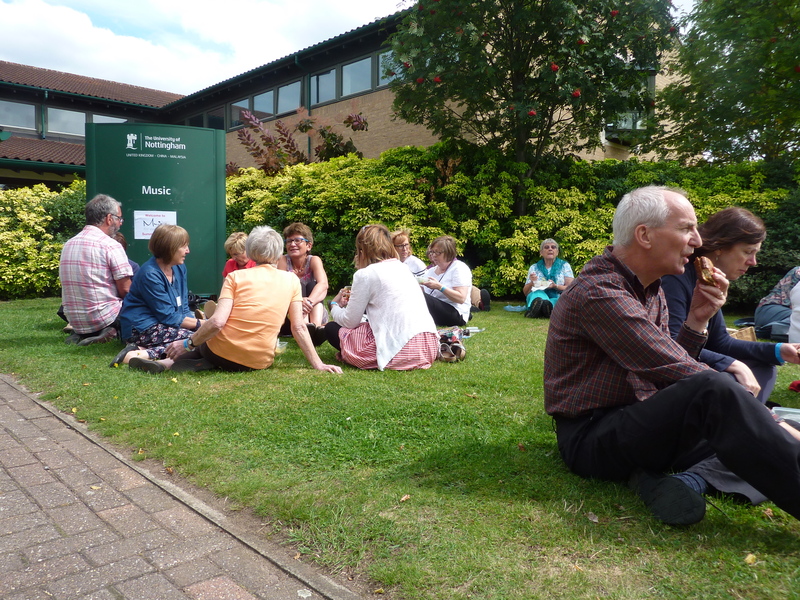 There was a buzz in the air as we gathered for a day of rehearsals in preparation for this evening’s concert, a buzz that continued through lunch eaten in the sunshine. During the day’s rehearsals the choir polished movements of Vivaldi’s Gloria, Byrd’s Civitas Sancti Tui, Mozart’s Veni, Veni, Spiritu, and two songs from Rutter’s When Icicles Hang. The lower voices rehearsed Stanford’s Songs of the Sea with Mike Gregory, and the upper voices learned the opening movement of Pergolesi’s wonderful Stabat Mater, which I have always wanted to sing. Jane McDouall gave us great tips for raising the soft palate for a bigger sound and ensuring the shape of the mouth is right for a richer tone. But what of the instrumentalists? 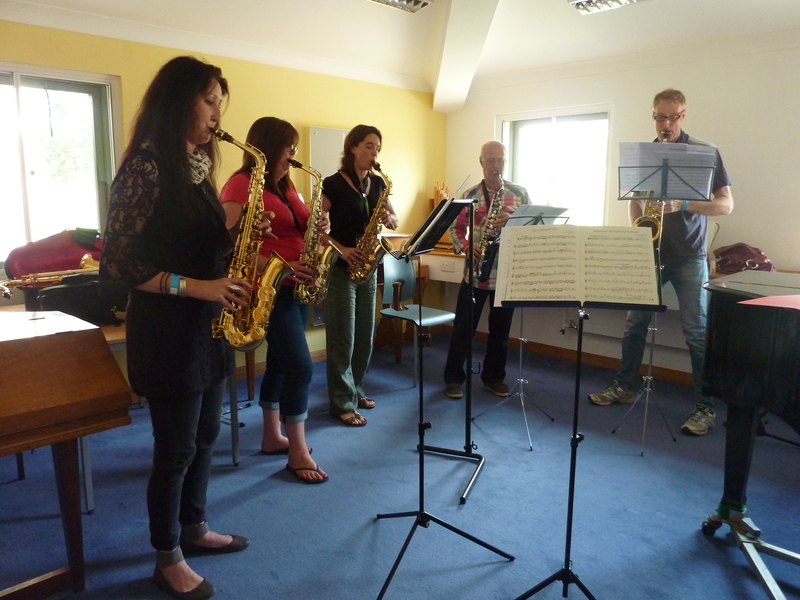 The saxophone group – 4 alto saxes and 1 tenor – were swinging some Gershwin. 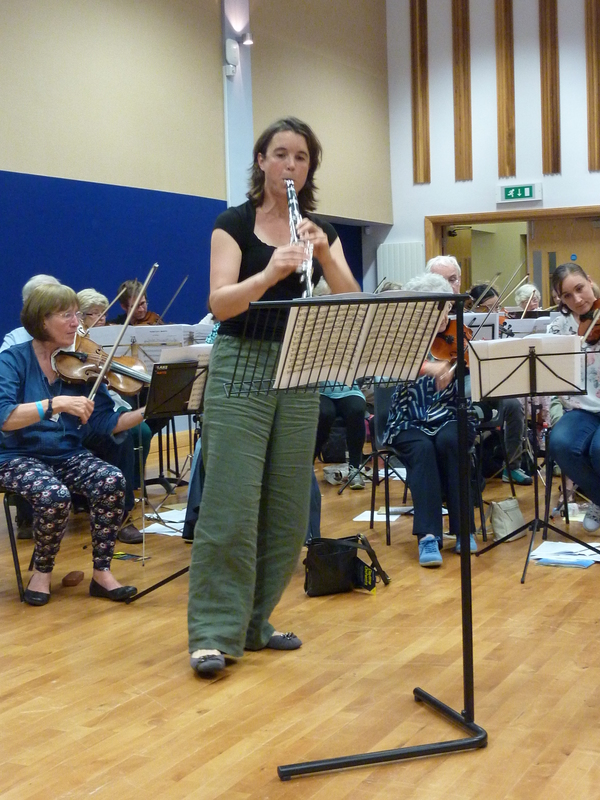 Third from the left is Gill Henshaw, a clarinetist and one of the tutors and conductors. The Wind Band blew the years away with a medley of Beatles numbers. Here’s Helen on percussion. Drum stick not in mouth at this point, but later. Sometimes two hands are just not enough. And there’s Chris on bass. Wait a minute, isn’t that Chris on sax above? Not in the picture, but blowing their hearts out, were the tootling flutes, oboes, saxes and a french horn. The strings ran through Peter Warlock’s Capriol Suite – ah, memories of school orchestra days, and isn’t there a piano version? A bit of trick photography in this shot – Owen didn’t have his back to anyone…! 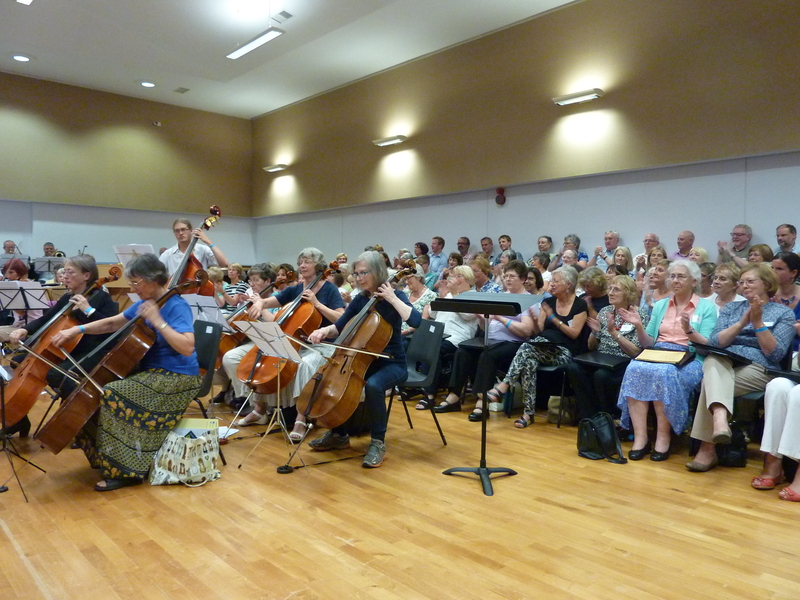 After a final rehearsal, orchestra and choir together for the first time, we tucked into a wonderful buffet made by Jo from Beeston’s Local not Global Deli. Very tasty. Here’s the final rehearsal with Angela Kay. More news tomorrow. 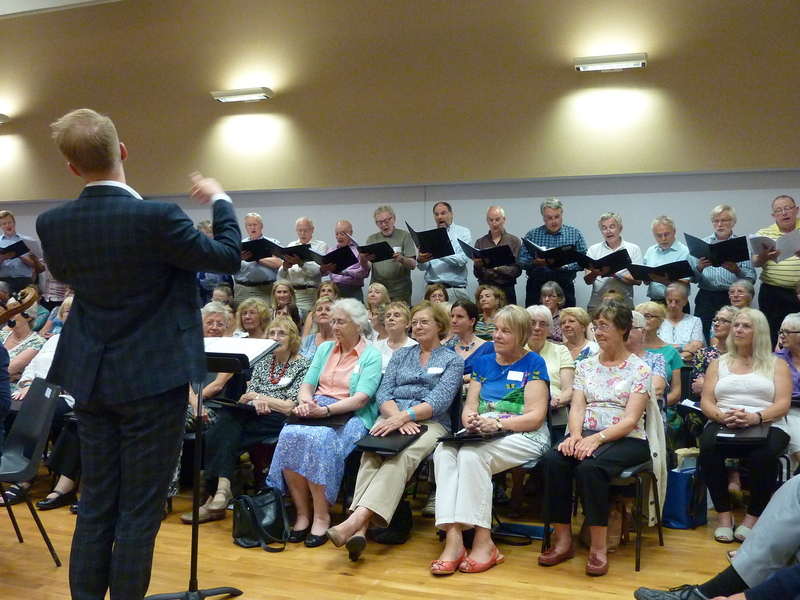 The SATB choir turned to Mozart and Byrd, that latter being one of my favourites. There was a handy hint from Alex, “Get round it by cheating,” and praise for the altos, “That moved me somewhat.” I was so caught up in it all that I missed the saxophone group. Sorry about that. Owen Cox is a violinist and alumnus of Music for Everyone. 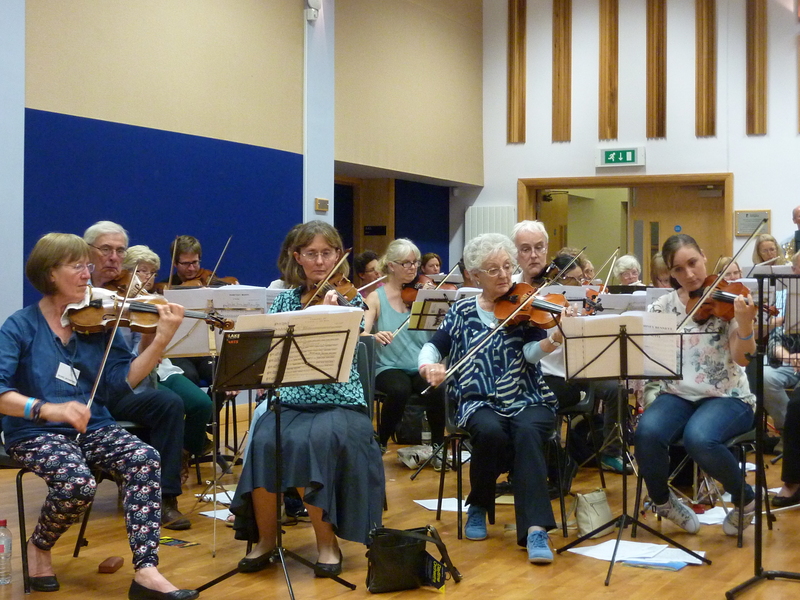 He played with the youth strings before progressing to the CBSO, BBC National Orchestra of Wales and many other orchestras and quartets around the world. 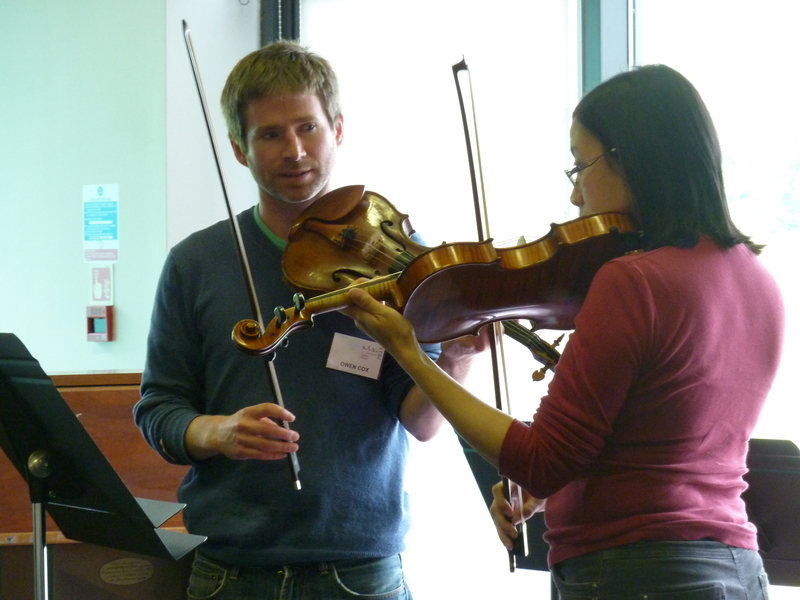 He also teaches and is currently Assistant Head of Strings at Chetham’s and honorary lecturer in performance at the University of Nottingham. See what MfE can do for you!! 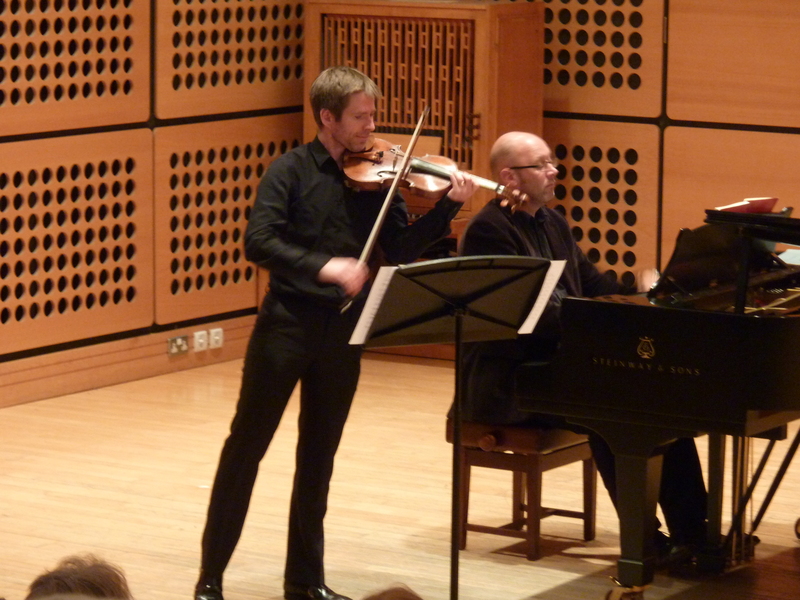 Owen, accompanied by Martyn Parkes, rounded off the day with the second concert. H e gave a light and beautiful performance of Mozart’s Violin Sonata K301 in G and a lyrical and lively rendering of a Franck Sonata – not, he pointed out, a Frank Sinatra. The movements alternate between slow and fast and are as demanding for the pianist as the violinist. 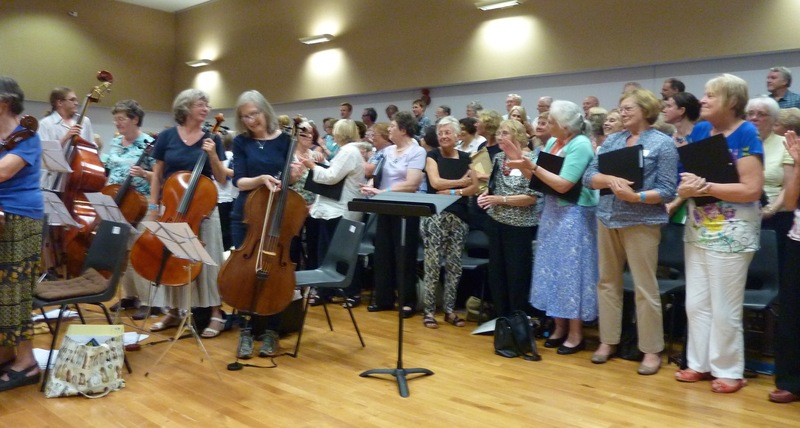 We have had a wonderful day of music in many styles, from many instruments, including the voice, gifted musicians and conductors, and talented accompanists. What could have been better? More tomorrow, and then we, the delegates give our own concert. I’m afraid that has already sold out, but do come and hear mezzo-soprano Carris Jones at 1.30pm, Djanogly Recital Hall. Sometimes everything goes quiet in August, but not this year! A large, brown envelope dropped through my letter box a few weeks ago brimming with information and music for the three-day Music for Everyone (MfE) Summer School. It starts next Monday, the 17th of August, at the University of Nottingham. I’m looking forward to excellent music-making with the other 203 delegates, lots of fun, and relaxing breaks (Ice cream!) in the beautiful surroundings of the University Park. 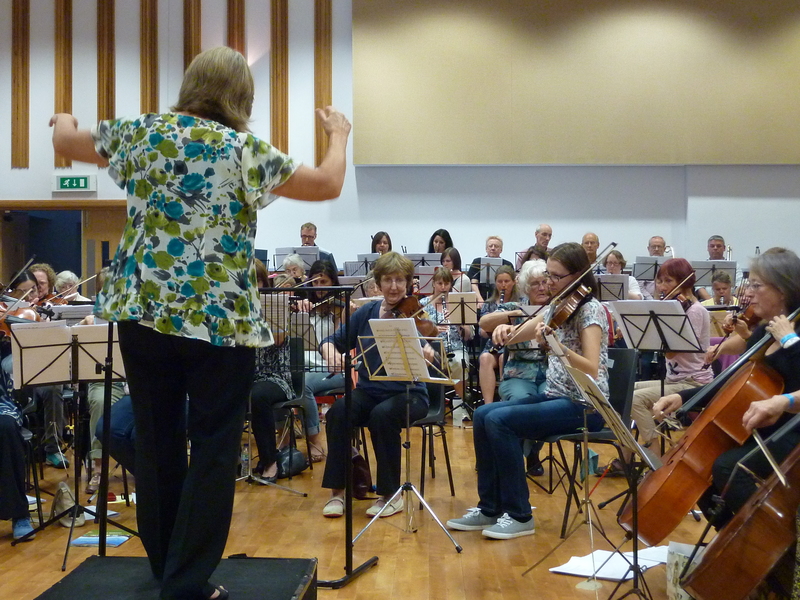 Visiting professional musicians, a cappella ensemble Apollo 5, mezzo-soprano Carris Jones, violinist Owen Cox and clarinetist Sarah Watts, will be giving workshops, masterclasses and short public concerts. No doubt the tutors, Angela Kay, Alex Patterson, Gill Henshaw, assisted by Jane McDouall, Mike Gregory, Isobel Bounford, Owen Cox, and Stefan Reid, will bring out the best in us. Having sung with MfE before, I know it’s going to be great. 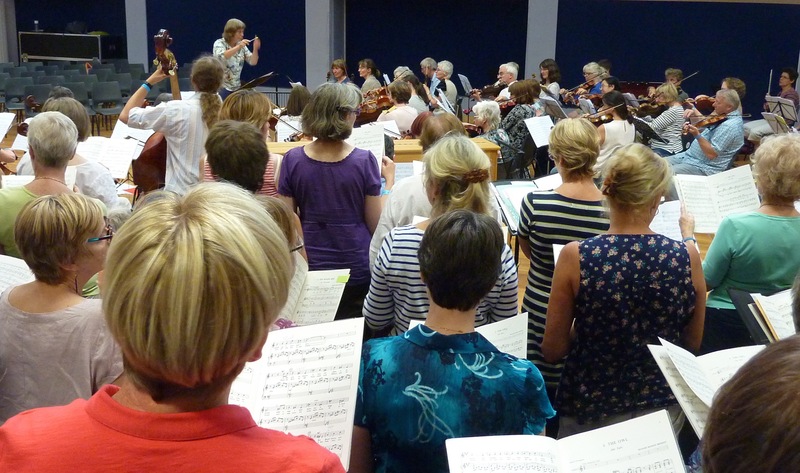 MfE have invited me to blog about it, which I’ll happily do between singing pieces from Byrd to Rutter, Vivaldi to Kodaly, and a few surprises yet to be revealed. I’ll pop in on the instrumentalists too. They appear to have an exciting programme of classical music, jazz and swing awaiting them. Maybe I should dust off my flute… Did I mention we’ll also be learning how to conduct?! 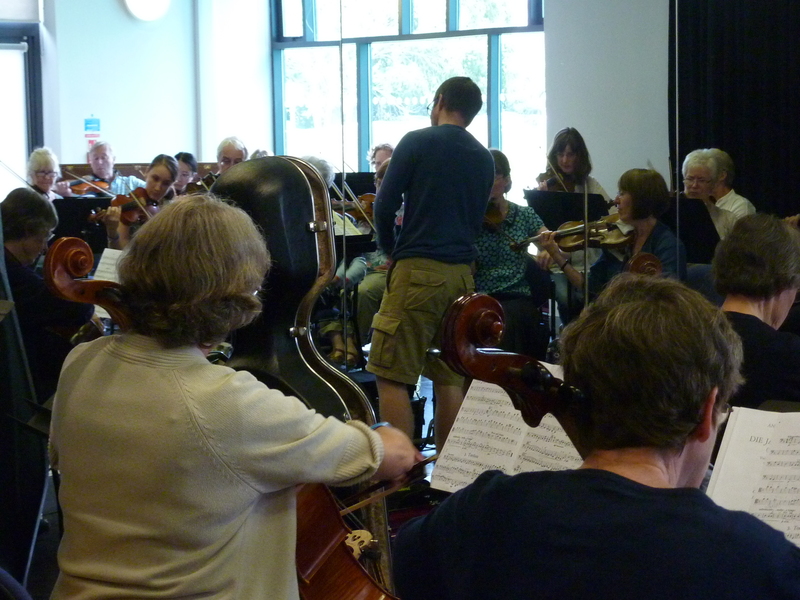 A note from the MfE office: Details of the concerts and tickets can be found here.